Trinidad macaroni pie is a Caribbean comfort food classic. It’s similar to a baked macaroni and cheese casserole, but the cheese isn’t melted down into a sauce before baking. Macaroni pie is a popular Trinidadian baked pasta dish that is made up of macaroni, cheese, eggs, evaporated milk and seasonings. I grew up eating my mom’s sweet macaroni pie which is essentially a basic macaroni pie recipe, with the addition of 2 tablespoons of brown sugar (or condensed milk). I love how the sweet pie pairs with stewed chicken, and no matter how many other versions I try, I will always prefer my mom’s pie over everyone else’s. “Traditional” Trinidad macaroni pie is made with macaroni, eggs, grated cheese, evaporated milk, salt and white pepper. Optional add-ins include grated onion or carrot, chopped herbs and tomato. At least, these are the ingredients that are listed in the 2002 edition of the Naparima Girls’s High School Cookbook (officially titled The Multi-Cultural Cuisine of Trinidad & Tobago & the Caribbean). This is the quintessential book on Trinidadian cuisine, and every Trinidadian family seems to have a copy of the book in their home. The first edition, published in 1988, lists only macaroni, eggs, cheese and carnation milk as the ingredients for the recipe. Salt, black pepper and grated onion are optional. Personally, I can see why they altered the recipe in the second edition of the book… I can’t imagine that the original recipe would be very tasty! I asked my friends and family to divulge what they put in their macaroni pies. Everyone said their pies are savoury, and everyone said they use milk and eggs. Some people use a combination of cheddar and mozzarella cheese, while others prefer just aged cheddar cheese. Some people add herbs, others add ketchup and mustard, and I have one aunt that makes a really tasty version with powdered ginger. My friend Heather from Heather’s Eats shared a Bajan (meaning from Barbados) macaroni cheese pie recipe with me too. That one was heavy on the mustard, using both hot English mustard and regular yellow mustard. It also included ketchup, onion and red pepper sauce, with optional sweet bell peppers, butter and breadcrumbs. The recipe really varies from family to family, which makes me wonder who gets to decide which version of Trinidad macaroni pie is authentic? I’m Trinidadian-born, my parents are also Trinidadian, as are my grandparents on both sides. We’ve always made our macaroni pie sweet, and no one else seems to. So does that mean that my mom’s pie isn’t authentic? If we’re using the Naparima cookbooks as the official source, then my mom’s version isn’t traditional either. But it’s our food – Trinidadian food. If we’re only meant to cook “our own people’s food” in order to preserve our culture and avoid bastardizing someone else’s, who gets to decide which recipes are the gold standard and which are not? If you read my previous post, then you already know that I don’t agree with this whole idea of not being able to cook “other people’s” food. There are so many variations in recipe, from country to country, village to village, even person to person, that it’s a bit ridiculous to think that certain recipes should be made one way and one way alone in order to be correct. This is my version of Trinidad macaroni pie – the savoury version that most people seem to enjoy. I tried making one with raw grated onion added in, just a quarter cup of it, and I really disliked it. So I’ve opted to cook my onions down so they become a bit sweeter before adding them to the pie. If you want the onion flavour, without the work, you can substitute a teaspoon on onion powder instead. I’ve also used dry mustard powder instead of prepared mustard, but you can use whatever you have on hand. For the cheese, you can use any cheddar that you like. I used a blend of white and orange aged cheddar cheese, but I’ve also used marble cheese in the past and it works out great (although the flavour is milder). In Trinidad, they get New Zealand cheddar cheese, so if you can find that it’s a good option. If you try making this recipe, I’d love for you to leave a comment and let me know if you enjoyed it. Or, if you usually make macaroni pie at home, let me know what you like to add to yours! A classic Trinidadian baked pasta dish with cheese. Grease a 9x11 baking dish, and set aside. Boil macaroni in salted water according to package directions. Once cooked, drain the macaroni and place back into the pot, leaving it off the heat to cool down. Melt butter in a skillet over medium heat. Add onions, cook until softened and slightly caramelized. Scrape the onions and melted butter into the pot with the macaroni. Stir to combine. In a large bowl, beat eggs until fluffy. Add milk, salt, pepper, garlic powder, dry mustard, dried thyme and cayenne pepper. Stir to combine. Pour the egg mixture over the macaroni and stir until well coated. Stir in 3 cups of the shredded cheese. Pour into a greased, 9x11 baking dish and top with reserved ½ cup of shredded cheese. Bake until the pie is firm, and the top is golden brown. About 35-40 minutes. Allow pie to rest for 10-15 minutes before serving. This dish is traditionally made with Trinidad-style cheese (New Zealand cheddar) but you can use any cheddar you like, or use a mixture of cheddar and mozzarella. EDITED AUG. 19, 2018: Dried thyme reduced to 1/2 tsp from 1 tsp based on reader feedback. This looks stunning. Can’t wait to try it! That is one neat looking pie Shareba, lovely recipe and beautiful photos! Thanks for stopping by Ginni! I totally agree with you about the Onion being cooked ahead of time. That is how I make my version, too (with a little diced ham,too). I would like to try this Trinidad version because we had a great connection to that place while we were on a Habitat for Humanity build (the first group from Canada). Thanks for sharing a recipe from that part of the world. That’s so nice! How long were you there for the build? Two weeks – and that is a long two weeks in the Trinidad heat 🙂 It was a great experience, though. We have done a few of those in different places. I hear you! I can barely stand the heat when I visit, it’s a different kind of heat than what we get here. Sounds like it was worth it though! I’ve tried the more traditional savoury macaroni pie, and it’s definitely my kind of comfort food. I’ve been begging my Trini coworker to share the recipe, but looks like I don’t have to any more… neener neener! I am from Bermuda and we, as a country, have created food by ‘borrowing’ from many different cultures. Many of the favourites have a sweet/salty combination and I just can’t get enough, as an adult, of finding recipes that satisfy that craving. I would be happy to share some of my faves including fried fish on raisin bread, fish chowder, cassava pie and the African dish Boboti which is delectable. We made this for xmas dinner last night. Not a single crumb was left. I was a bit easier on the thyme than suggested and added some shredded parmesan on the top edges for the crunch. Super recipe! It was really nice, but the egg felt a bit odd addition compared to macaroni pies I have had before. Still really nice but would probably leave out the egg next time. Hey Ally, thanks for trying the recipe! 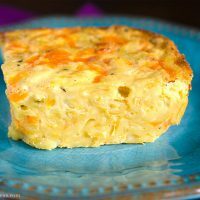 Trinidadian macaroni pie always has an egg or two in it, two bind the filling together. But I have seen Southern pies that leave it out, so it should work if you omit it (although I’ve never tried that myself). Could be, both of my macaroni pie recipes use 3, but I know I’ve made them with 2 when I’m low on groceries. I’ve never noticed the egg flavour coming through, but I’ll have to try it with just one and see how it turns out. I’ll make a note to test this again later, thanks! Mac and cheese usually has red and green peppers, garlic, diced ham, sometimes broccoli and like 4 different types of cheeses. Anyway, yours is delicious, I am finding the thyme too strong though. I would probably half it next time or maybe use fresh thyme instead. And I’m going to increase the amount of onions next time. Thanks for sharing. Yummm…currently eating my second helping today!!! Hi Jan, thanks for sharing your feedback on the recipe. I’m glad you still enjoyed it 🙂 Your version sounds delicious too! Just a quick note to say that I’m editing the recipe to decrease the amount of thyme from 1 tsp to 1/2 tsp, based on reader feedback! I hope he likes it Maureen! Definitely let me know how it turns out! Was not looking for a specific recipe. Just a basic pie recipe.. In my search your recipe appeared. I attempted the recipe listed. The pie was delicious, moist and excellent flavor. Since this pie was for one, I averaged the ingredients, added more spices and chili pepper; and used 1/2 and 1/2 creamy milk instead. Thanks. I’m so glad the recipe worked out for you Esther. Thanks for sharing your adjustments too! I happened to run across this recipe after looking for Sorrel Drink recipes. Wow, I just made this about a week ago (my own recipe) with sautéed onions, evaporated milk, half-and-half, and plenty of eggs—what a coincidence! All the suggested add-ins are great [except I don’t go for the meat; although not Carribean, I am Rasta]. Previously I thought this was a Southern (U.S.) thing, baked Mac & cheese. It’s interesting to find that it’s also a Carribean/ Trinidadian recipe. Hi Pala, thanks for your comment. You’re right, it’s very similar to baked mac & cheese. I think there are some similarities in Southern cuisine and the cuisine in parts of the Caribbean, which is pretty cool. I hope the Sorrel Drink recipe worked out for you!